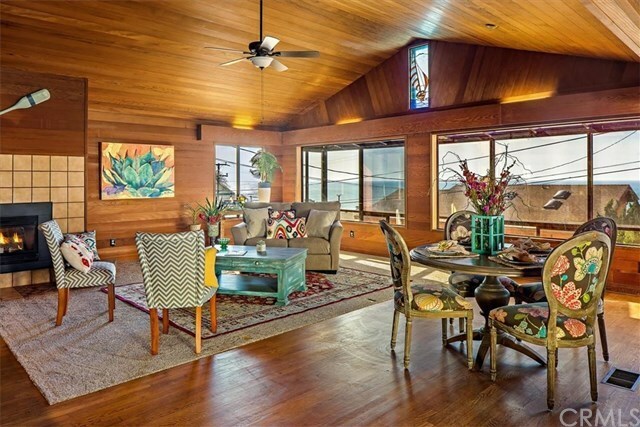 Stunning Cayucos beach house with white water ocean views, close to the sand, shops and restaurants. This unique home features 3 bedrooms and 3 baths with a bright open floor plan. Upstairs you will enjoy a large kitchen with island for entertaining, a living room with vaulted wood ceilings and fireplace, master bedroom with walk-in closet and large master bath. There is a sun room, laundry room and second bath off the kitchen. Gorgeous redwood throughout with wall to wall windows. Downstairs are two more bedrooms, a third bath and a wine cellar complete with cooler. The bottom level could easily be turned into a separate rental unit for added income. This home has undergone a recent update with new carpet throughout, new french doors and new lighting. The large two car garage is an added bonus and has plenty of storage cabinets. There is a dumb waiter for bringing items upstairs and a second sun room that runs the width of the house to maximize the views. Come take a look at this great home. Buyer to verify and investigate square footage of this home. Don't miss this rare opportunity. Directions: Highway 101 to Chaney Avenue left right on Haines Avenue, left on Davies.